This is crisp and refreshing clear and pale lager. It has a bubbly but fine head on the initial pour. It’s mild but pleasant aroma is in stark contrast to its lightly sweet and dually highly hopped flavor. With hints of nuttiness, citrus, and fruit, it lingers on the palate with a lasting honey sweetness. This beer smells a lot like a lager… hence that it’s an American Adjunct Lager. Not sure what the adjunct means, but hey… it smells good. I am sitting here with some buddies, and a guy just took a whiff… he said it smells like “rotten lemons”. Um, rotten lemons? Has he ever been in a room with a rotten lemon? Not sure where he gets that from, but hey… this guy likes to hang out with rotten fruit, I guess! Anyway, I think this beer smells incredible. It does have a small hint of citrus. But I wouldn’t call it rotten. Look… he made me mad. Now all I can think about is a dirty rotten lemon! Let’s see if it tastes better than it smells. I hope. It’s VERY clear, so I hope there is some carbonation in there. There is… and there is some insane sour coming at me here. When I see a beer that is in a language that I can’t pronounce, I want to grab some sushi and hang out on the patio. But I feel like I have had this beer before. At any rate, it tastes a lot better than it smells. That sour… right off the bat. I like that. And it sticks around for a little bit too. This beer is crisp, would be great on the porch watching the sun go down. This has to be the Chinese Budweiser. At any rate, it’s good. Maybe one day when I visit China I can drink one with the natives. Yummy! Bottoms up people. I think we are slacking a little bit here on our beer reviews. Has it really been a week? Wow. But don’t worry, we will get back on track… after all, we have almost 950 beers to review yet! 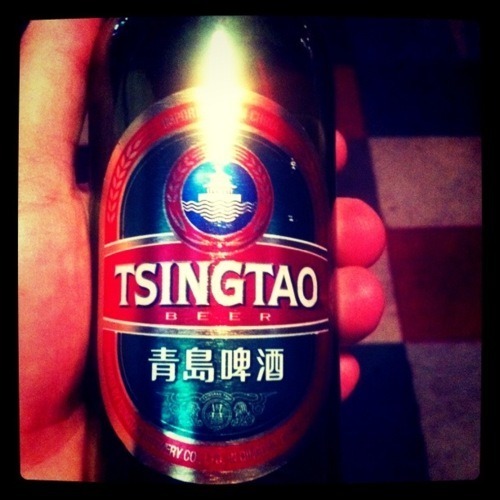 Tonight’s beer is the Tsingtao. It doesn’t look like much. Kinda looks like it could be Bud Light in that glass, as pale and thin as it is. It pours out into the glass as a light yellow color, slightly carbonated with not much head. It smells a little like bread, with just a hint of fruit. The bread gets stronger the longer it sits. Let’s see what it tastes like. Very weak and thin taste… but not horrible. You’ve definitely got the European beer taste in there. It’s not a Bud Light, that’s for sure. It’s a very light beer, but still has a hint of flavor to it. This beer can’t have a very high ABV. I would prefer this to any American domestic, but it’s definitely not one of my favorites. It’s very light and crisp with not a lot of flavor, but more taste than an American domestic. I wouldn’t mind it if it was what was available overseas. I can’t see drinking it much here in the States, as I know there is always something more interesting available. Probably wouldn’t buy it again on a normal basis. Look at this… Jake Long is with us… AGAIN! Can you believe it? I was sending him a text message to see if he was coming tonight… and look… here he is! How cool is that? Anyway, I told Jake that if he was coming he was going to have to drink with us. So here you go Jake… bottoms up buddy! Hi again – Jake here. Little did I know I’d be put on the spot again tonight…lucky me! Let’s jump in, shall we? Appearance of Tsingtao is very pale and golden with a small eggshell-white head that doesn’t stick around long. Looks like every other adjunct lager ever made. This smells…not great, in my opinion. I’ve never been a big fan of lagers, especially adjunct lagers like Bud/Miller/Coors, and this falls right with them. It’s sickly sweet with a stale rice and grass aroma and a slightly sour twinge on the end. Somewhat reminiscent of a bad green tea. I’d imagine this is what the stomach contents of a cow would smell like. That might be a bit harsh, but hey. Thankfully this tastes better than it smells. It’s very light and crisp, mildly sweet, with a slightly sour kick on the end. A light grassy hop character shines through as well. The finish is rather dry and grassy and lasts for a little while longer than I’d prefer. Not horrible, but not great. I wasn’t excepting the sourness, but it’s not refined enough to save this otherwise woefully mediocre adjunct lager. In the end, this beer has a bit more flavor than I expected, and the sour kick was a nice surprise – it was somewhat reminiscent of Bell’s Oarsman Ale, though definitely not in the same league. I’ve had worse, but if given a choice between other Asian lagers I’d definitely grab a Chang or Tiger first. I’ll pass.